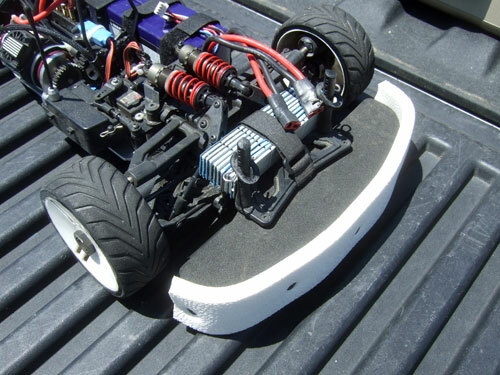 After have lots of problem keeping the DM1 on the ground while going over 90mph. 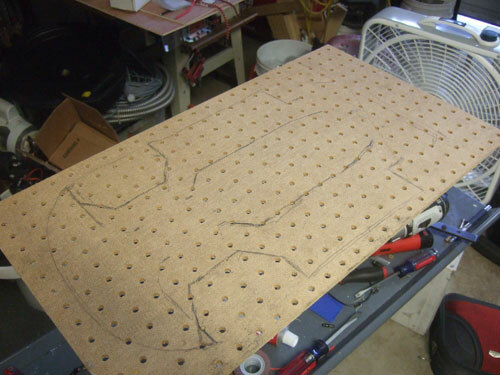 I came up with an idea of sealing bottom of the car by making a cover with a pegboard. 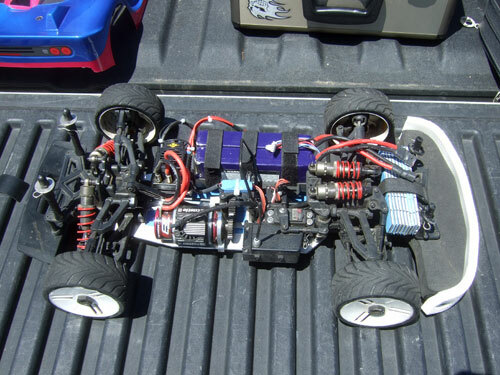 I guess you can say it's more like a borrowed idea from Traxxas' X0-1. I wanted to test out this concept before I make a better version of it. To make a long story short, it really works. 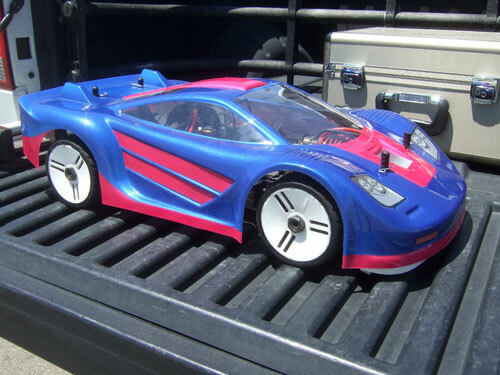 The DM1 was a lot more stable at high speeds. I guess this mod it not too bad for an hours worth of work. Before making the lower chassis cover I need prevent any air coming in front the nose of the body. I used some dense foam floor mat and glued it to the original foam so now the body sits directly on the foam. I also added 1 lbs worth of weights to the front of the car. Here is a better view of the foam on the front bumper. 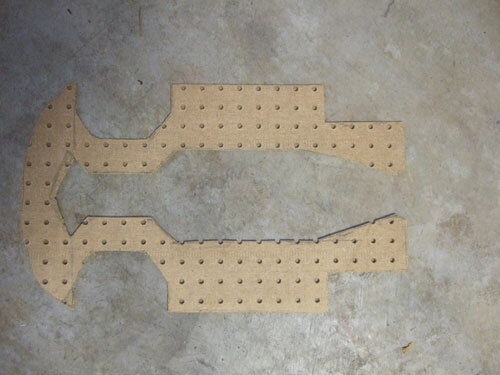 I put the car over the wooden pegboard and traced the chassis on to the board so I will know where to cut. Afer a few rough cuts, here is what I came up with. Test fit the cover on the car, and it seems to fits okay. 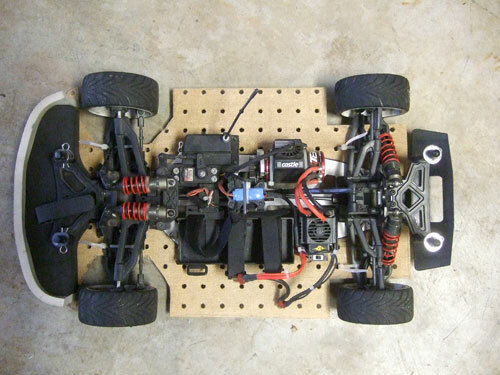 The board is held on with 4 cable-ties on each arm of the car. 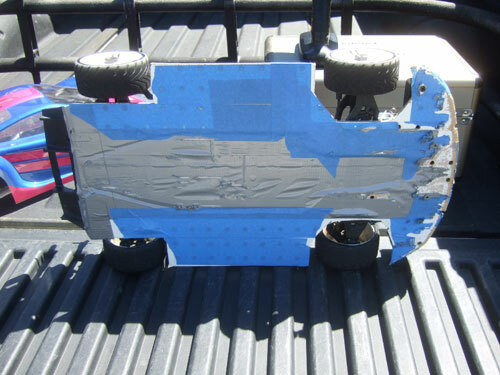 Then I duct tape the board to the chassis and covered all the holes with painters tape. After a few runs, this is how it looks. 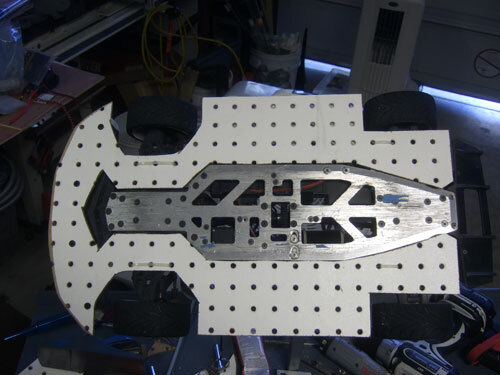 Here is a video of the car with the lower chassis cover.